The purpose and the mission of the European Information Technologies Certification Institute is to accelerate growth of the international information society and knowledge based economy, as well as to counter digital exclusion in societies worldwide. For this purpose EITCI Institute develops international framework of quality standards for Information Technologies education and certification processes (focusing on development of relevant IT certification programmes and related methodologies) responding to dynamic shortening of technological solutions life cycles, as well as rapidly changing competencies requirements for sustained competitivity on jobs markets. Parallely EITCI Institute supports vendors in adhering to highest quality standards in Information Technology solutions' development and deployment by implementing technological testing and certification upon set of international and European norms. EITCI Institute believes that digital skills are the most empowering skills to change situation of social groups partially excluded in terms of education, economy and health. We also believe that adhering to the highest quality standards in professional IT competencies dissemination will move the world forward in better understanding of its environment, general ethics, science, technology, work efficiency and healthcare. IT skills have a much greater impact than just introducing new ways and increasing efficiency of how information is processed and communicated. This is because information is about knowledge. And knowledge is about responsibility. Pursuing development and international dissemination of high quality standards in IT competencies, EITCI Institute understands problems of people with all kinds disabilities. EITCI Institute believes that IT skills are one of the important means to at least partially overcome physical bariers related to disabilities. Therefore EITCI Institute since its conception in 2008 continues to put all our efforts at providing IT education and certification services upon the EITC and EITCA Certification Programmes free of charge to all interested disabled persons. To apply under disability exemption please register here. EITCI Institute realizes as well that our future is with our children. Therefore EITCI Institute also pursues free IT skills dissemination and certification among school youth internationally. This it makes not only the Digital Literacy Certificate (DLC) and IT ID e-CV standards but also all EITC and EITCA Certification Programmes freely avaiable to all school youth worldwide before accessing the tertiary education level. All interested pre-tertiary students should apply here. Additionally to accelerate growth of the Inclusive Digital Society, EITCI Institute seeks to support people of low socioeconomic status (low SES) worldwide in free access to high quality IT education and certification. In case of applying under a low socioeconomic status (low SES) for free access to EITCI Certification services a detailed surveying will be further performed to evaluate eligibility for exemption from the Certification fees that will take into account the current country of residence (accordingly with the IMF classification and estimated costs of living), as well as education, emplyoment and material situation. Depending on the verification of the calculated normalized SES it may qualify one to either a full exemption from all fees on all EITCI Certifications or to a range from 95% to 80% fees reduction on EITCA Certifications in EITCI cofunding. EITCI Institute pursuing Inclusive Digital Society also fully opens the services of IT ID e-CV standard along with the integrated Digital Literacy Certificate (DLC) for e-presentation of IT competencies and the access to the EITCI Cloud European IT Professional Community platform offering its services free of charge to everyone interested in the EU and abroad. One of important goals of EITCI Institute is to counter gender inequalities and disparities, especially in the developing countries. EITCI Institute understands well that a key to effective inclusion of women into modern economy with no prejudice lies in effective dissemination of IT skills and competencies especially among women thus enabling them to take strategic positions in globally developing Inclusive Digital Society. Since 2008 EITCI Institute implemented number of ESF cofunded projects targeted at developing IT competencies of women in the EU on a large scale. Currently EITCI Institute plans to scale similar actions globally. 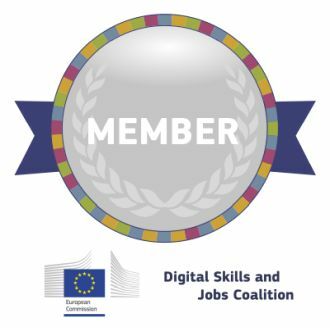 Increasing efforts in achieving its goals and supporting especially excluded social groups, EITCI Institute, as a member of the European Commission's Digital Skills and Jobs Coalition, has recently launched an initiative within the Coalition. More details are available at the EITCI Institute's DSJC pledge initiative page.